Line the base of the tins with baking parchment paper. Heat the oven to Gas 4 / 180C. Cream together the fat and sugar, gradually beat in the eggs then fold in the flour, salt and grated zest. Put into the tins, level the tops and bake for approximately 25 minutes or until firm to a fingertip touch. Turn out onto a cooling rack and leave to get cold whilst you make the filling and topping. Filling: beat the mascarpone with the grated zest of the two tangerines and tablespoon of juice. Peel the tangerines, cut the segments into small pieces and fold them into the mascarpone with the icing sugar. Topping: in a wide pan over a low heat dissolve the sugar in the water. Slice the tangerines thinly, place in the pan, bring to the boil and simmer gently until the peel softens – about 20 minutes. Carefully remove from the pan onto kitchen paper. Sandwich the cakes together with the filling. Brush the top with the hot jam and arrange the tangerine slices on it. Brush them with the jam. Note: if using oranges follow the same method but you may not need all of the orange slices on the top. 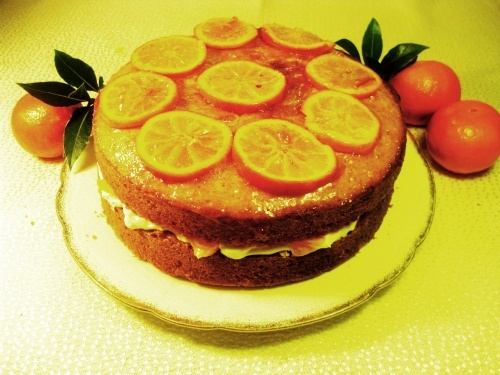 Substitute 1 orange for 2 tangerines in the cake and the filling. You can use double cream instead of the mascarpone, whip it very lightly.